When it comes to your kitchen, if you think about it, most of the elements not only have to function aesthetically regarding your design, but they also provide serious functionality. Your windows are a perfect example. A big beautiful window can turn an otherwise functional kitchen, into a design powerhouse, while a smaller window in the right place can bring in just enough natural light to pull a great kitchen together. Your kitchen windows need to offer both form and function when it comes to kitchen remodeling. 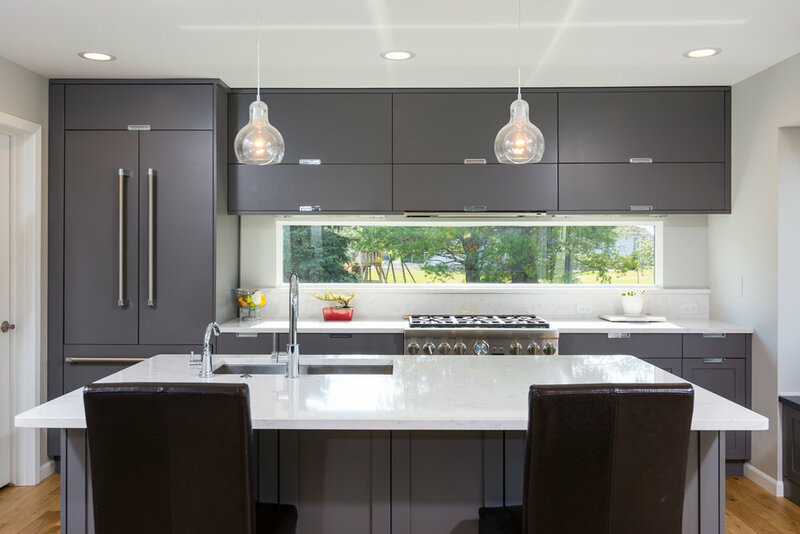 Here are some of the critical factors to consider when choosing the perfect kitchen windows for your remodeling project! What to Look For In A Kitchen Window... Functionality! • Ease of Use – Often there will be windows placed over your sink or counters. It can be a bit of a chore to reach them so unless they're fixed windows; you want to make sure they are easy to operate. • Control of Air Circulation - Your kitchen windows are an essential element in the ventilation of your space. While your vent fan will remove more of the smoke, odors, and heat from cooking, your kitchen windows can replace the stale air with cool fresh air. • Aesthetics – Form is important as well we function! You want your windows and your entire kitchen to be aesthetically pleasing. Any windows you choose should look great on the inside and outside! Being able to customize the look of your replacement windows is important. • Control The Natural Light - No one likes a dark kitchen! You don't want to be slicing veggies in the dark, and you don't want to rely on just artificial task lighting. Large windows in the kitchen can bring in the natural light and make your kitchen feel warm and inviting. Now that you know what to consider regarding functionality. Let's take a look at kitchen window styles. Window styles include casement windows, double-hung, single hung, plantation style and more. Each window style has unique benefits that can meet your needs. Windows also come in a variety of different materials. Which you choose depends on your design needs and personal preferences. Let's examine some of the most popular styles of kitchen windows. Typically attached to the frame by hinges, casement windows open much like a door, usually using a crank to open and close. Typically used in pairs to create a dramatic look, casements are versatile and can fit in almost any space. Because of the crank open, they allow for maximum ventilation and can scoop air into your kitchen with the passing breeze. They offer ease of operation when placed over a sink or counter. Awning windows are hinged at the top and open outwards to cover the opening. They're practical not only due to their size, but because that allows you to open the window during rain. Very useful for a small window over the sink! Bay or bow windows consist of a set of windows that create a “curve.” Typically they include a large central window flanked by two or more smaller units. Both require a bit of space and must have a small roof over the area, but they offer a wide view of the outdoors and can function as space to hold plants like fresh herbs or flowers that need plenty of sun. Garden windows are a variation of bay/bows. Sliding windows are an excellent choice for above the sink as they offer ease of use. Typically they sit on a track and slide left or right to open. Think of them as a double hung window on its side. They offer great control for air circulation in the kitchen. By far the most popular style, double hung windows fit into any room in the house including the kitchen. Double hung windows offer great circulation as the open from either the top or the bottom. Plus they offer plenty of safety as most have two sets of safety latches to prevent them from being opened too wide. When it comes to construction, how humid your kitchen gets and how close windows are placed to your cooking surfaces can direct you to the best material. Windows are available in aluminum, wood, vinyl or aluminum clad wood options. If your kitchen is humid or the window is near the cooking surface, opt for a sturdier option such as all wood, or aluminum clad wood frames. They will provide you with the durability you'll need and in the case of aluminum clad wood, come in a variety of color options to match any décor. If you're planning a kitchen remodeling and you'd like to learn more about window options, give the experts at Forward Design Build a call at (734) 761-8403. We're always happy to help homeowners to create their ideal kitchen, right down to the windows!